Whenever new chefs come to work with me, I have them rummage through the fridge and use up stuff. I help them out. "Look, you have four endives here and a couple of apples there. Let's make a salad." You can make a salad out of almost anything, but pairing bitter flavors with sweet is one of my favorite ways to do it. The combination always works. 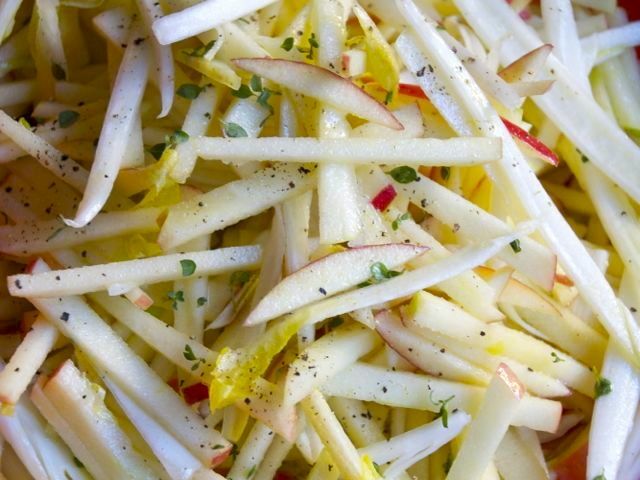 With endives and apples, the salad comes out so crisp and delicious, it only needs some fresh herbs and a squeeze of lemon to bring it all together. Put the lemon juice in a medium bowl and gradually whisk in the olive oil in a steady stream until blended. Then whisk in the thyme leaves. Cut the apples and endives into thin strips about 2 inches long. Add the apples and endives to the dressing, then taste and season with salt, pepper, and a little sugar if necessary. The salad can be assembled, covered, and refrigerated for up to 2 hours before serving.